ST. LUCIA (May 29, 2018) – Guests at St. Lucia’s luxury resort Anse Chastanet are in for a special treat next month when Mango Madness returns from June 13 to 17, 2018. The popular event celebrates the tropical fruit and offers mango-themed activities to entertain and educate visitors. 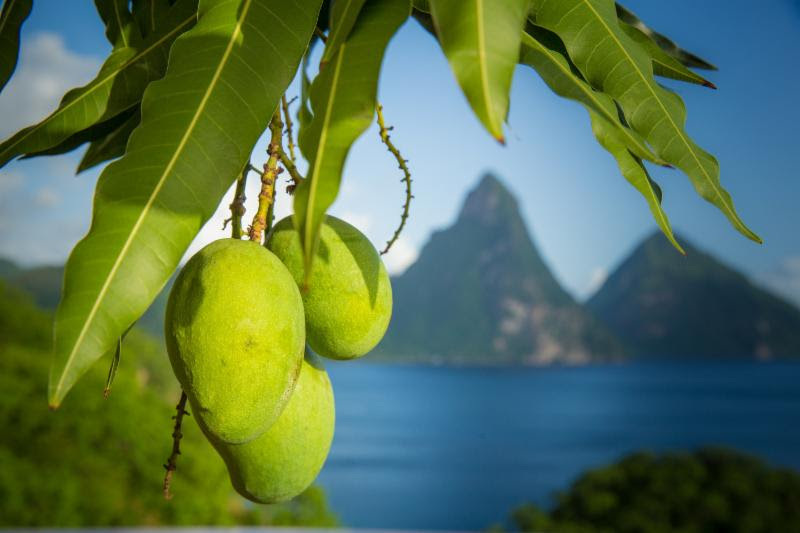 “We have mango trees in abundance across our organic Emerald Farm and will continue our annual celebration of this fascinating tropical fruit while we educate our guests and enhance their food and beverage experience at the resort,” said Karolin Troubetzkoy, Executive Director of both Anse Chastanet and its sister resort Jade Mountain. As part of the five-day festivities, there will be a live, interactive cooking class using mangos as the core ingredient. Participants will learn to cook with the flavorful fruit in the Chef de Cuisine’s special cooking class. “There we will reveal the secrets of preserving the exotic flavor of mango while creating traditional chutney,” said Troubetzkoy. As always, the popular Jungle Grill on Anse Mamin Beach will be available to delight visitors. In keeping with the theme of the week, the grill will deliver an infusion of mango flavors in salads, fresh fish and homemade burgers. Guests will also be invited to feast on a mango breakfast of exotic fruit, artisan cheeses and freshly brewed St. Lucian coffee and cocoa tea. For the evening pleasure, there will be a five-course mango dinner including a wine pairing that is just right for each dish. In addition to cooking classes, experienced bartenders will reveal their secrets and teach mango mixology, featuring the Caribbean’s favorite spirit – rum. Mangos will be featured in a wide variety of dishes next month. “Throughout mango season guests can experience our mango tasting menu, special mango cocktail list, fresh ripe and fresh green mango juices for breakfast and mango-infused spa treatments,” said Allen Susser, the resort’s James Beard Award-winning consulting chef. Mangos will also be featured in various jams, jellies and chutneys that will be available in the restaurants and for sale in the boutiques. Visitors to Anse Chastanet can stroll back in time with a tour of the historic Anse Mamin plantation, which began as a sugarcane plantation in the 18th century. The area has now become home to cocoa plants and other produce, including mangos. Festival attendees will learn more about the resort’s farm-to-table conceptual dining with a tour of the organic farm, which includes a variety of mango trees along with other locally-grown produce. “For those who love mangos, this festival is a must,” added Troubetzkoy. Anse Chastanet is set amid a lush 600-acre estate with two soft-sand beaches and breathtaking views of St. Lucia’s twin Pitons mountains, a UNESCO World Heritage Site. Amidst St. Lucia’s lush tropical beauty, activities range from jungle biking, hiking and bird watching to snorkeling on the reef within swimming distance of the beach. The environmentally friendly, award-winning resort comprises 49 individually designed rooms, 37 of which are scattered about a lush hillside, and 12 that are nestled within a tropical garden at beach level. Innovative menus – one of which is entirely vegetarian – are offered in four different locations and feature fresh produce served up from the resort’s organic farm. Guests can partake in interactive chocolate-making classes in the resort’s chocolate laboratory and a variety of water sports are also on offer.